Good-shaped, free-flowering, evergreen shrub. Has dense spiny branches with glossy, deep green, pointed or rounded leaves. Provides masses of small white flowers in early summer and a good show of bright berries throughout autumn. A very tough and useful, pollution tolerant, shrub. Very hardy. Will thrive in most garden soils, in sun or partial shade. A useful plant for gardens with coastal exposure. 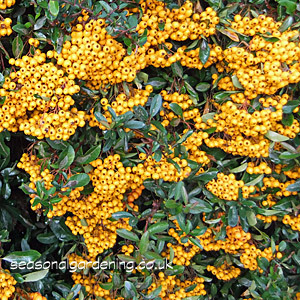 Pyracantha is a native of south-eastern Europe and Asia. The flowers are particularly attractive to bees. It also attracts birds in the autumn who love the berries. Can be grown as a freestanding shrub, trained against a wall or clipped to from a hedge; where its dense format and sharp spines will help deter intruders. Average height and spread: 8 to 15ft (2.5 to 4.5m). Will tolerate any aspect, full sun or partial shade. An ideal shrub for a north-facing aspect. However a sunny position is desirable for a good show of flowers and berries. Any ordinary well-drained and reasonably fertile soil will do. Tolerates dry, clay or chalky soils. Plant in spring or autumn. Wall plants need trellis or wire support. If grown as a hedge, space plants 15-24 in (375-600mm) apart. Easy plant to grow and needs very little attention. If grown against a wall, tie-in new growth in spring/summer. Prune as required to keep shape. Trim back any shoots that have not flowered once flowering has finished (Note: excessive clipping of flowering shoots will reduce berry production). Certain varieties can spread rapidly once established but will normally regrow from old wood. Can be pruned back hard if necessary. Always wear gloves when pruning to protect against thorns. Watch for aphids and scale insects on stems and leaves. Die-back in branches can be caused by Fireblight. Take 3-4 inch (75-l00mm) long cuttings of firm young shoots in summer or by heel cuttings in late summer. Root in a propagator. Alternatively, sow seeds in a cold frame or greenhouse in October. Vigorous shrub with glossy deep green leaves. Upright habit. Clusters of white flowers in June and deep red berries in autumn. Height and spread 8-12 ft (2.5-4m). Mid-green pointed leaves. Bares clusters of white flowers in June and bright red berries in Autumn. Very popular as a supported climber. Particularly valued because of its ability to grow on a north aspect. Height and spread 10-15ft (3-4.5m). Narrow mid-green leaves. Vigorous grower with an arching habit. White flowers in summer and orange-red berries in autumn. Form 'Flava' has yellow berries. Height up to 10ft (3m), spread up to 15ft (4.5m).